Buying foreign stocks, ETFs, or international mutual funds can be a great way to diversify your portfolio. But first, you'll need to decide how much of your money you want to allocate to foreign investments. In part, the answer will depend on your appetite for risk and the length of your investment horizon. While there's no "right" answer for everyone, there are a few guidelines that can help guide your decision, which are important to consider. 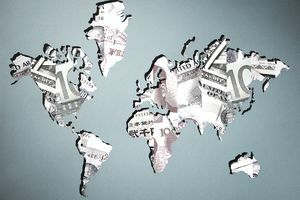 In this article, we will look at some important considerations when determining how much international exposure is right for your portfolio. One way to begin is to look at the size of the U.S. stock market in relation to the rest of the world. Picture a pie chart of all the stock markets in the world, with each slice representing a particular country's stock market. The bigger each market, the bigger its slice of the pie. The U.S. accounts for roughly one-fifth of the world's total stock market value. So if you wanted to divvy up your portfolio in the same manner as our imaginary pie, you would simply invest half of your money in U.S. stocks, and the other half in foreign markets. In practice, however, an 80% allocation to international stocks is probably too aggressive for most investors, especially those who are new to international investing. This is because international markets often exhibit greater volatility than the U.S., which can make them riskier in some ways. But don't be too shy. If you only invest a small amount, say 5% or 10%, overseas, you won't be able to take full advantage of the many benefits that international markets have to offer, including the ability to diversify against any domestic downturn. As with a lot of things, the truth lies somewhere in the middle. Most financial advisors recommend putting a range of 15% to 25% of your money in foreign stocks. I think 20% is a good place to start. It's meaningful enough to make a difference to your portfolio, but not too much to hurt you if foreign markets temporarily fall out of favor. Besides, you can always ratchet up your exposure as you become more comfortable with international markets. While the precise allocation to foreign stocks will differ from one investor to another, the worst thing anyone can do is flip flop between having too much exposure and not enough. So once you've settled on a number that suits your comfort level, stick with it. Don't make the mistake of trying to outsmart the markets by jumping in and out of foreign stocks. One last thing: it's important to make sure your international investments are spread across various regions and countries. Putting 25% of your money in say, China, and the rest in the Dow Jones isn't what international diversification is all about. Make sure you have evenly balanced exposure across Europe, Asia, and emerging markets. There are many different ways to spread out your international investments across multiple countries. Often times, exchange-traded funds (ETFs) and global mutual funds are the easiest ways since they don't involve buying individual stocks or using foreign brokerage accounts. The Vanguard FTSE All-World Ex-U.S. ETF (NYSE: VEU) is one of the most popular and lowest cost options with holdings around the world. When selecting funds like these, investors should ensure that they're not buying more exposure to U.S. markets, since they already have build up exposure in the rest of their portfolio. Stick to "ex-U.S." funds to do so. Investors should keep an eye on expense ratios when selecting these funds since these expenses are the easiest aspect to control when it comes to generating returns. Seemingly small expenses can quickly add up to tens of thousands of dollars or more over a lifetime of investing. Buying foreign stocks is a great way to diversify a portfolio. International ETFs or mutual funds are the easiest way to gain access. Most advisors recommend 15% to 25% exposure to these markets. The exact amount of exposure depends on an investor's individual situation.